The Priest is definitely back! I just picked up Angel Of Retribution and gave it a first listen – the CD rocks. It’s got the sound of classic Judas Priest. Take Painkiller, Screaming For Vengeance, Stained Class and a bit of Hell Bent For Leather and this is what you get. “Revolution”, the first single, is a progression from the Painkiller sound. There are even a couple of slower songs, “Worth Fighting For” and “Angel”, the later of which is reminiscent of Hell Bent For Leather‘s “Before The Dawn”. The best all out rocker on this disc is probably “Hellrider”, which sounds like it could be a rewritten left-over from Painkiller. The worst thing about Angel Of Retribution is its length – only 10 songs, roughly 52 minutes long. The bonus DVD shows that Judas Priest can still rock live. It contains live footage from last years reunion tour in Europe of “Breaking The Law”, “Metal Gods”, “A Touch Of Evil”, “Hell Bent For Leather”, “Electric Eye”, “Diamonds And Rust” and “Living After Midnight”. Also included is interview footage with the band discussing how the reunion came about, the new CD, touring and many other subjects – to my knowledge the band has never given an interview like this before, definitely interesting and informative. I would say this disc is a must have for Priest fans and anyone who likes quality heavy metal. 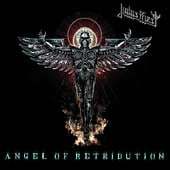 I give Angel Of Retribution 7.5 out of 10. www.judaspriest.com. Reviewed by Ken for Sleaze Roxx, March 2005.